This page shows you how to install an RGB-compatible video card into your computer and configure Windows to output the correct signal for your RGB monitor. VGA monitors have a minimum refresh rate of 31Khz, where RGB monitors use a 15Khz refresh rate. As a result, you need to output the exact refresh rate of 15Khz, which most video cards are not set up to do. In an attempt to force my video card to output a compatible signal, I spent hours trying every software tweak I could find, from using PowerStrip, to creating custom monitor drivers to even creating a custom Intel video driver…and it was all a waste of time, because my video card (Intel integrated video) was not compatible. Don’t waste your time like I did: This page will show you how to find video cards that are able to output a 15Khz signal. I’ll start with the easiest solution, which only works with motherboards that have PCIe (PCI Express x16) slots. Then I’ll talk about AGP & PCI solutions. A site called ultimarc.com has worked directly with AMD (formerly ATI) to make a graphics card that natively outputs a signal that is RGB-compatible. Simply install the card, install the software and configure the resolution. After you set the resolution, unplug your VGA monitor and plug it into your RGB monitor. One very big advantage to this card is that the resolutions always stay in the setting you leave them, even during startup or shutdown, so you won’t put any strain on the monitor by temporarily having an unsupported mode passed through. I’ve been using this card for awhile on both Windows XP and Windows 7 and really like it! Also, the latest version of the card (5000 vs 3000) is slightly more powerful and fanless! – Phisically install the video card into your PC (with the PC powered off and unplugged…obviously). – Connect your PC to a VGA monitor. – Start with a fresh installation of Windows XP. – Install the video card driver; as well as any other driver the computer needs & reboot. I uploaded the ATI Radeon 9200SE drivers that worked for me – Maybe these will work for you? – Copy a program called Quickres into your Windows startup folder, then run it. You can download Quickres here. – Run Soft15Khz and enable 15Khz for both listed outputs. You can download Soft15Khz here. – Power off your PC. 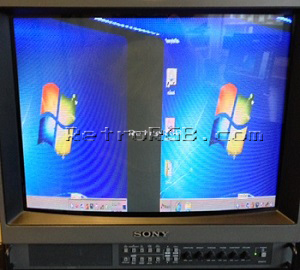 – Disconnect the VGA monitor and plug in the RGB monitor using the special cable described below (leave the RGB monitor OFF). – Power on the PC and wait until you hear the Windows startup sound. This is because the computer will start in 480p, which may be damaging to your monitor. It’s best to wait until the computer has loaded and switched to 15Khz before turning on the RGB monitor. – Turn on the RGB monitor. – If you’re getting the above screen, re-connect the VGA monitor and see if you missed a step. – If needed, you can use Quickres to quickly change resolutions between 640×480 (which will now be 480i) and 320×240 (240p), which makes arcade games and emulated old games look great!! Certain monitors, accept an RGB signal via a VGA port, allowing you to use a standard VGA cable. 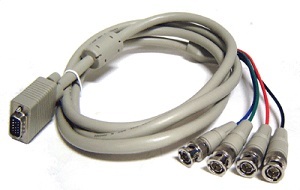 Other monitors will require you to make a cable that starts as VGA and ends up in the proper format. If you’re usng a SCART switch, you may want to consider building a custom VGA to SCART cable. I built one myself and it works perfect, but I haven’t had time to update the site with a how-to guide. If you’d like to give it a try, just use VGA and SCART pinouts and make sure to combine the H and V sync pins into the one SYNC pin on the SCART connector. You can try to find a VGA to 4 BNC (RGBs) cable, however you’ll need to make sure that the cable has both H and V sync signals combined into the one SYNC cable. Most VGA to 4 BNC cables only have H-Sync coming through the sync cable, which will not work in this scenario. Feel free to go back to the main VGA to RGB Monitor page. If you think this solution may not work for you, check out the page that shows you how to convert any VGA source to RGB!. If you’re done, I highly recommend you check out the other great guides listed on the main page…especially the RGB Guide!